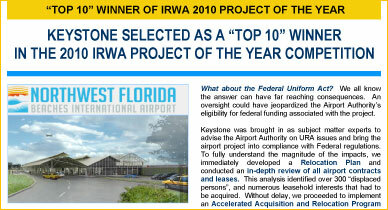 We are excited to be selected as a "Top 10" winner of the IRWA's 2010 "Project of the Year" competition for our performance on the Relocation of the Panama City – Bay County International Airport to the New Northwest Florida Beaches International Airport. Our team of Uniform Relocation Act (URA) experts was chosen by the Airport Authority to bring this $310M airport project into compliance with Federal regulations. Keystone delivered an accelerated right of way acquisition and relocation program in 10 months, ensuring the fair and equitable treatment of over 300 "displaced persons". This was the most aggressive and successful airport relocation program in the country. The Northwest Florida Beaches International Airport is considered the "gateway" to Northwest Florida's future, and Keystone made the on-schedule opening of the new airport possible. We take great pride in this important achievement, and are thrilled our project was recognized as a "Top 10" winner by the IRWA. Click the announcement below to learn more.